Even if you're not the resolution-making type, it's fun to imagine the first day in the new year has the power to hit our internal reset buttons and inspire us to make major changes. I don't usually make resolutions, but I try to create semi goals especially when they pertain to clothes. Applied to my closet, the "Out with the old, in with the new" mantra translates into editing my wardrobe. Small adjustments actually do have the power to change the way we think about and celebrate style in the long run. No matter what the upcoming year has in store, your style will always be a reflection of you. These tips are designed to help you take control of your wardrobe, feel empowered by it, and have some fun in the process. Plus, they're pretty simple, too. What message are you trying to get out about yourself to people? Your personal style speaks volumes about your personality. Think about that when putting your outfits together. Wear the colours that work with your skin tone and hair colour. Embrace your shape. Get items tailored to make them fit perfectly for YOU. Accessorize with one of a kind jewellery, belts, and chic shoes. 2. Be thoughtful in your fast-fashion indulgences. Ask yourself what you honestly need to purchase and what can be left on the rack. When you do buy, look for unique pieces that serve a purpose or challenge you to step outside your comfort zone without dishing out major dough. 3. No more wistful lusting for those Louboutin shoes or that Celine bag (I'm actually talking to you, Portia). Divide your dream item's price by 12 and come up with creative solutions to save that amount every month. Skip a monthly manicure, or make some cash selling an unworn item in your closet. Even if it takes all year to afford that investment piece, you know you'll wear for a lifetime. 4. Whether it's the main fixture of your wardrobe or simply plays a supporting role, the basics are important. Buy basics that can stand up to months or years of wear. 5, Most likely, the majority of the people in your life won't be seeing you in your undies. But you should shop for your intimates like you do your outerwear. You want them comfortable and covering the goodies, and also pretty. 7. Don’t let what others think affect your sense of style. The right outfit can transform any boring day into something spectacular. It can even transform YOU and the actions you take. If you’re more confident in an outfit that you think you look fabulous in, people will recognize that and be drawn in by you. 8. Spend your money wisely. If you go back to the clothing you got rid of, you will most likely find it was a lot of lower quality clothing that you bought just because it was on sale. Stock up your wardrobe with beautiful, high quality pieces of clothing that will never go out of style. Now is the time to clear out all the clothes and accessories you never use, and sell them: all proceeds will go towards buying that delicious designer handbag you've been dreaming about but would never normally be able to afford. Eat healthy, Work out more, Stress less, Sleep more and don't forget to drink lots of water! We all get stuck in a make-up rut, but with so many cheap and cheerful ways to update your make-up bag, now's the time to experiment. If you're not ready for an extreme makeover, start small, powder, blush and lip-gloss. A good outfit isn't complete without good make-up. If you are completely clueless about make-up, got to Youtube for tutorials, its been of tremendous help to me. When you're getting dressed in the morning, imagine you are a celeb and that the paparazzi is outside your house waiting to take your photo. Now, step away from that boring black ensemble or that plain jeans n tee outfit and wear a fitted dress, add a bright accessory, maybe some fabulous heels, and make the side walk your catwalk. It's so much easier putting a look together with plain separates. Polka dots, Stripes, Crazy colour prints can be worn to make a statement. Try adding prints to your wardrobe before they go out of fashion again. It's no good having a perfect wardrobe if you disregard the details. This year, make a regular date for a manicure and pedicure, facials, body massage, hair etc. Newsflash: pink is the new black, red is the new white and orange is the new grey. You get the picture. 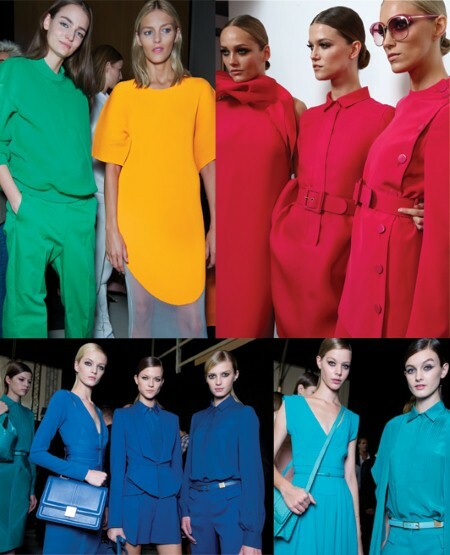 Ditch the monochrome and make colours your muse this month. Good underwear helps your looks fit and look better. Invest in good fitted bras and shape-wears. Instead of splurging on multiple high street treats for a quick fashion fix, save up to buy one classic item that will see you well beyond the end of the fashion trend. Its time to find a proper skincare regime, and crucially, stick to it. Break lazy habits - remove your make-up thoroughly every night, use a toner, invest in an eye-cream, exfoliate regularly. Look great, feel great! And your make-up would look better when your skin is healthy. I don't take risks especially with my hair. But I'll try something new this coming year (I hope...), you should too. Instead of buying yet another little black dress this party season, splurge on a piece of statement jewellery instead. Buy a sequin or embellished dress for that dinner. Rock a studded clutch. Stand out! Develop your own fashion formula, know your proportions and be true to yourself. Make it more about clothes than fashion trends. Prints may be on the runways, but don’t wear something that overwhelms you. I personally prefer to notice the person before the dress. Keep prints simple and classic. Have fun with fashion and love yourself in 2016! Source: All around the web. Lesson – Limit Frivolous Spending! BTW...enjoyed your weight loss post.